Klipspringer's range of standard shadow boards offer up our best selling designs, options and colours further simplifying the purchasing process. We have brought together our best selling shadow boards making the ordering process of these fantastic boards even easier. Don't forget of course that we can also offer fully bespoke shadow boards entirely suited to your application and equipment! For more information on our bespoke shadow boards and further examples of what we can offer, please click here. 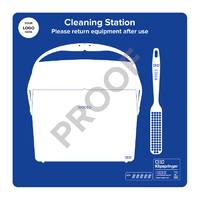 A popular cleaning station for the end of production lines, packing areas, despatch areas as well as QA offices. A dustpan and brush are almost always the first hygiene utensils of choice when looking to remove larger debris from work surfaces. All utensils are approved for food contact. This design can be personalised with your company logo, heading and instruction text at no extra cost. Just add to your order and our design team will be in touch to confirm the detail. A full colour proof will be provided for approval prior to being printed. 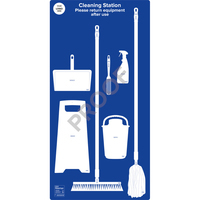 A popular cleaning station for any area of your organisation. KsPrism's meticulously designed lobby pan incorporates many features which make it unique and highly effective for content collection. All utensils are approved for food contact. This design can be personalised with your company logo, heading and instruction text at no extra cost. Just add to your order and our design team will be in touch to confirm the detail. A full colour proof will be provided for approval prior to being printed. The ideal shadow board for areas prone to a build-up of surface liquid/water and debris. Particularly well suited to high-risk and despatch areas, as well as amenities. All utensils food contact approved. This design can be personalised with your company logo, heading and instruction text at no extra cost. Just add to your order and our design team will be in touch to confirm the detail. 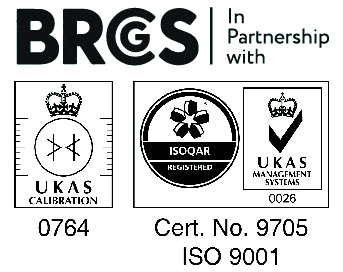 A full colour proof will be provided for approval prior to being printed. How quickly can you deal with a spill or breakage on the factory floor? 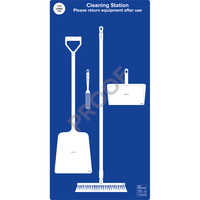 It’s all about having the right equipment in the right place at the right time, which is precisely what this floor sweeping station provides you with. 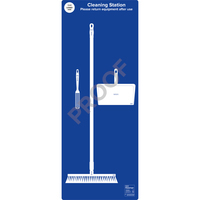 A no messing, straight forward sweeping solution with floor sweeper, dustpan and brush. All utensils are approved for food contact. This design can be personalised with your company logo, heading and instruction text at no extra cost. Just add to your order and our design team will be in touch to confirm the detail. A full colour proof will be provided for approval prior to being printed. 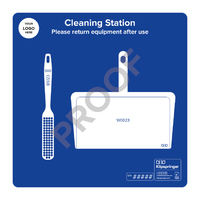 Take your floor sweeping solution to the next level – add Klipspringer’s well-reputed lobby pan and brush to your cleaning station. Floor sweeper and hand brush also included, meaning you are covered for every floor sweeping requirement. All utensils are approved for food contact. This design can be personalised with your company logo, heading and instruction text at no extra cost. Just add to your order and our design team will be in touch to confirm the detail. A full colour proof will be provided for approval prior to being printed. Is your floor subjected to a build-up of more substantial debris? 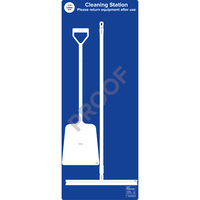 This floor cleaning station allows you to take this all in your stride with a shovel to assist the removal of larger debris, along with sweeper brush and dustpan for the perfect finish. All utensils are approved for food contact. This design can be personalised with your company logo, heading and instruction text at no extra cost. Just add to your order and our design team will be in touch to confirm the detail. A full colour proof will be provided for approval prior to being printed. 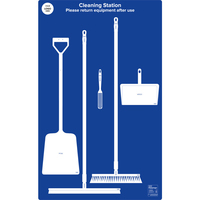 Ensure your mopping team have all the tools they require to hand with this complete floor mopping station. Use the hygiene sweeper, dustpan and brush to remove loose dirt before finishing the job with a microfibre socket mop. Trigger spray and mop bucket complete the kit. This design can be personalised with your company logo, heading and instruction text at no extra cost. Just add to your order and our design team will be in touch to confirm the detail. A full colour proof will be provided for approval prior to being printed. 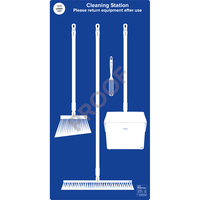 Every cleaning utensil required for floor cleaning on one shadow board; single blade squeegee to move water/liquids, broom to sweep up light debris/dust, shovel for moving larger and more stubborn debris, along with a dustpan and brush for those finishing touches. All utensils are approved for food contact. This design can be personalised with your company logo, heading and instruction text at no extra cost. Just add to your order and our design team will be in touch to confirm the detail. A full colour proof will be provided for approval prior to being printed.